Ooma Office is a cloud phone system for business that’s there 24/7 to answer your calls and ensure your business is always present. It’s packed with advanced business phone features to help run your office with efficiency, all while saving you big money. All you need is any of our IP phones. Plug it to your high-speed internet, and start calling. No matter how many users, the Ooma Office monthly cost per user is always $19.95/month. Call 877-959-6662 today! It is easy and flexible. Choose our IP Phones or get our Base Station and use your own phones. VoIP Phones & Accessories for Ooma Office. Call 877-959-6662 to get your discount! 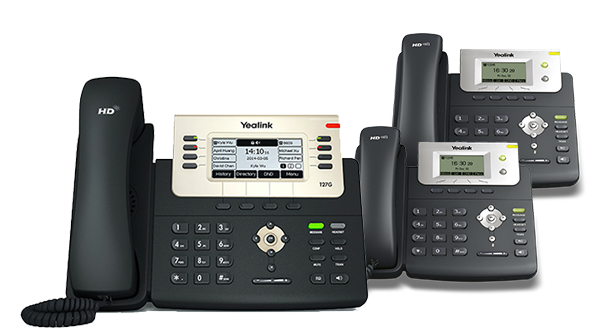 Yealink’s SIP-T21P E2 takes entry-level IP phones to a level never achieved before. It has a 2-port Fast Ethernet switch with PoE (Power over Ethernet) support, an extra-large 132×64-pixel graphical LCD with backlight showing a clear 5-line data display, 2 line keys, 4 soft keys, and a RJ-9 connector for optional headset. It supports up to 4 simultaneous calls. Cisco’s Small Business SPA 303 IP Phone features exceptional voice clarity and enhanced speaker quality. It has a 2-port Fast Ethernet switch, a monochrome LCD display, 3 line keys, 4 soft keys, and a 2.5 mm jack connector for optional headset. It supports up to 6 simultaneous calls. Cisco’s Small Business SPA 504G IP Phone features exceptional voice clarity and enhanced speaker quality. It has a 2-port Fast Ethernet switch with PoE (Power over Ethernet) support, a monochrome LCD display with backlight, 4 line keys, 4 soft keys, and a 2.5 mm jack connector for optional headset. It supports up to 8 simultaneous calls. The Yealink CP920 IP conference phone is a perfect choice for small and medium-sized conference rooms. The full-duplex and acoustic echo-cancelling technology allows clear and life-like conference calls. With its intuitive user interface and plenty of advanced extras including WiFi, Bluetooth, and Power-over-Ethernet support built in, the CP920 strikes a balance between ease-of-use and powerful features. Perfect for employees on the move, this phone combines portability and call management capabilities with a sleek design. This cordless phone delivers a perfect balance of mobility and call management. The phone comes equipped with a Yealink W60P base unit and one Yealink W56H handset. The base unit can support up to 7 additional Yealink W56H handsets – perfect for growing businesses.